Full-timers reputedly take everything with them in their RV. There’s no “home” for your stuff except your RV, the home you live in year around. Stuff can get heavy, especially when stuff is densely packed. And RVs have specific limits on hauling heavy stuff. We don’t want to run around the country without any books, food, water, or gear. We could simply declare everything is “a critical need” no matter the weight. Bad idea. How do we figure out how much we can take? Many RVers have pulled truck and travel trailer across the CAT scales at a truck stop somewhere. Perhaps you’ve stopped by one of the state’s weighing scales? Any of these seem to provide a reasonable look at compliance with overall weight restrictions. Trucks and trailers each have maximum allowable weights, called gross vehicle weight rating or GVWR. The truck and trailer also each have gross axle weight ratings (GAWR) specific to each axle. The truck has an additional rating you might need to look for a little deeper, the GCWR or gross combined weight rating. This is the maximum allowable total combined actual weight for truck and trailer. You cannot use the two vehicles’ listed weights for this, you need to know what your fully loaded weights are. The CAT scales provide you these total weights for the truck and the trailer for under $10 USD. You won’t obtain weights for any given corner, or tire load, from these truck scales. They weigh across the entire width of the axle for the weight supported by the left and right tires of each axle. 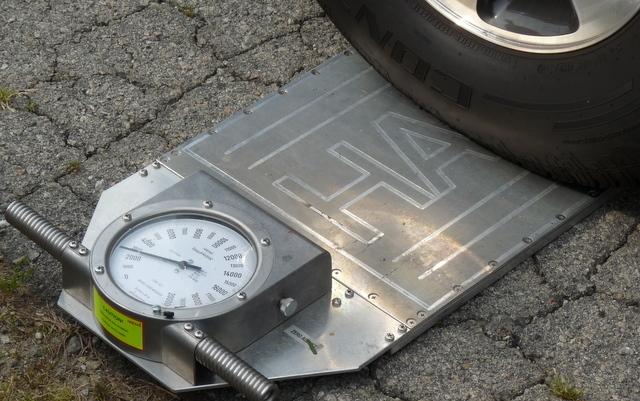 Portable scales can provide weights for each individual tire’s load. We had not attended any rally offering this more detailed weighing and were interested in how balanced, side to side, our truck and our trailer are. A prime reason for us to attend the Escapees rally in Marion this past weekend was their SmartWeigh program. Mark Nemeth, Escapees technical advisor, supervised and documented the wheel by wheel weighing of our trucks and trailers. This accurate weighing system provides this information beyond what we obtain from CAT scales. We learned the load per tire for all eight tires. The first weighing was truck only, front axles first. Not surprisingly, Jim’s side weighed thirty pounds more and corresponds closely to our difference in body weight. The rear axles highlighted a 250 pound difference, probably attributable to the 295 pounds of gasoline remaining in the fuel tank on the truck’s left side and the 150 pounds of tool box at the left rear. Twelve percent imbalance from left to right may not be a big deal but probably explains the utility of tires rotation, eh? More importantly, we want to be attuned to weights distribution for safely towing our full-timing setup down the road. Our trailer’s weight on the axles is 5,650 pounds. This is good, our axles rating is 6,000 pounds so we are 350 pounds under the maximum rating. Unfortunately the axles aren’t loaded equally. The front one is 3,200 pounds and the rear is 2,450 pounds. So we plan to raise the hitch head’s height to move weight from the front axle to the rear. We will re-weigh the trailer’s axles afterward. We learned our weight-distributing hitch needs a little tweaking. Jim knew the hitch wasn’t loading quite enough to the truck’s front axle. The trailer’s weight distributing hitch is still allowing the trailer to push the truck’s rear fenders down over an inch and raise the truck’s front fenders one-half inch. The weighing shows in more detail the problem with the trailer hitched to the truck — five hundred pounds added to each truck rear wheel, and fifty to one hundred off the front wheels. We don’t want to see weight subtracted from the truck’s front end. Our hitch head is already mounted at the draw bar’s top holes. Jim plans to tear the hitch head down and paint it so it’ll look as good as the a-frame and other hitch parts. Then he will invert the draw bar to provide additional upward adjustment and raise the trailer’s front two inches. He will adjust the hitch ball’s tilt away from the truck to increase the loading to the truck’s front axle. We could have obtained these results from CAT scales easily enough. But the CAT scales would not have shown us our side-to-side loading. Our trailer’s rear axle weight is equal from side to side. The trailer’s front axle is two hundred pounds heavier on curb side and we don’t think we can effect much change on this — we’re not ready to move the case work or holding tanks. And the truck is less than two-hundred pounds heavier on the curb side, which we can account for and alter by relocating some of the truck bed’s heavier contents. We have corrections to make on the hitch and fine tuning on our loads. Jim has another project, again. Then a trip to the CAT scales to verify the improvements. This entry was posted in Full-timing, Maintenance, Safety and tagged axle weights, CAT scales, Escapees, gcwr, SmartWeigh. Bookmark the permalink. Hey ya’ll: What a valuable post. Was just wondering yesterday how I would know if my wd hitch is set up properly for my tow vehicle and what is the proper feel of the truck when towing. This information might help with that. Guess I will have to look for an Escapees rally in Texas to get weighed in. Dana, don’t wait for an Escapees rally. Go to a CAT scale and get a weighing as soon as possible. The CAT scale may not give you side-to-side differences but that won’t matter for the purpose of getting your hitch set up properly. 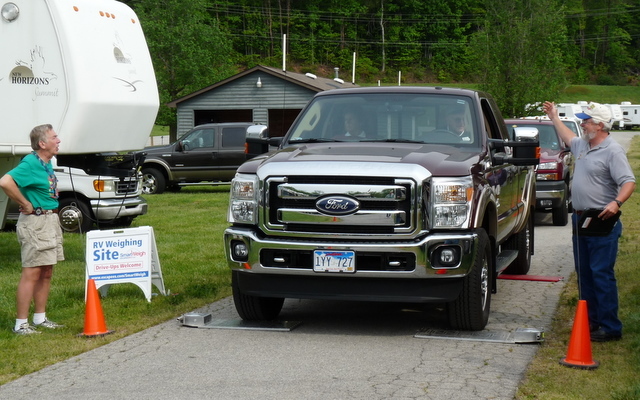 You may be amazed at the difference in ride quality and handling after you get the wd hitch re-adjusted — and proper weight distribution is critical to safe towing. Vehicle weight ratings are called ratings because they are not limits. One should know the difference, why the words are used, and what the consequences actually happen to be when weights start to approach ratings. One way to get a surprisingly effective measure of load on each wheel is to measure its footprint. Run your rig up on some suitably sized smooth boards and draw a line around the tire print. Check the tire pressure and write it on the board for the tire too. If the boards all the same width and tires at about the same pressures, then the differences in measure between the lines at the front and rear of the tire on each board will give you a relative weight indication. Total footprint area in square inches times psi will give you a weight on that wheel. 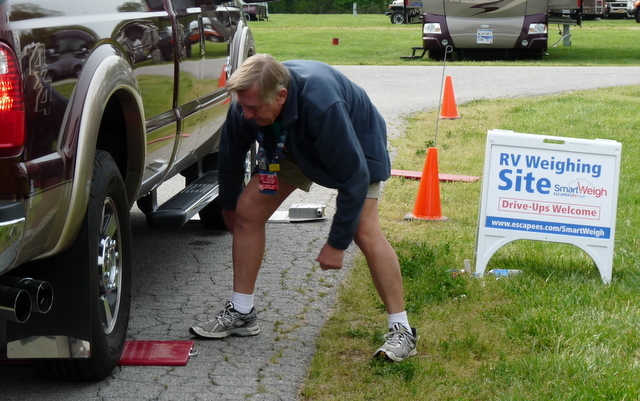 and this measure is really of sufficient accuracy for most RV needs. I make a scale stop every year when I head out for our summer travels. The results have been educational. In 2009 even though we looked level we were too heavy on the truck’s rear axle. In 2010, after a load and hitch adjustment, we were properly loaded but a little higher on the front of the truck than the rear. I think I’ve got it right now, but we’ll make a scale stop when we head out for the Northern Experience caravan later this month.